Today I went with my mate Gossy to Mindarie Quay to check out the place where she’s considering having her wedding. It was quite gorgeous, even though it was an overcast day – and we even saw a dolphin, which we took to be a good omen. 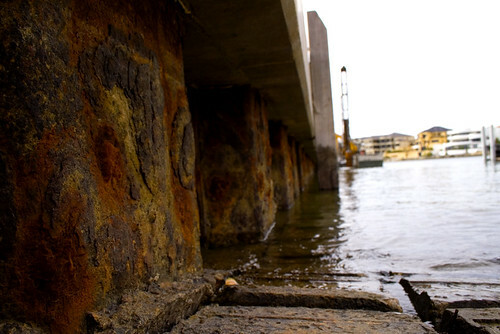 And of course, I took my camera and snapped this for Photo Project Day 4 – a rusty pylon underneath the jetty beside the boat ramp. So sorry Gary, although I was doing ok inside the house with my little photo project, this was too good an opportunity to pass up. ~ by goatlady on January 4, 2007.